One benefit of the construction of a new concrete standpipe on Barden Hill in 1915 was the vista which it afforded from the catwalk which circled it partway up its side. At that time, this photograph picturing the view towards Middleborough center was captured. Still recognizable today are Middleborough Town Hall and the Central Congregational Church. The steeples of both the Central Baptist and Methodist Churches also provide handy landmarks, although these have since been replaced or redesigned. Most noticeable is the Barden Hill standpipe's predecessor, the Forest Street standpipe, which is the cylindrical tower which interrupts the skyline in the distance. A new standpipe to replace the existing one then situated on Forest Street had been contemplated as early as 1892 when Dr. Edward S. Hathaway offered to sell a lot on his highest ground in the proposed Fairview subdivision (which appears as the large cleared area just left of center in the photograph) to the Fire District. Though initially receptive, Middleborough's Water Commissioners the following year demurred, remarking that “it is possible that when a location is finally made it may be best to accept a lot offered by E[verett] Robinson, Esq., located near Wareham street, at the top of the hill.” The Robinson lot was 34 feet higher than the base of the Forest Street standpipe and thus presented the opportunity to construct an equally effective reservoir but of limited height. Clearly sensing an opportunity, Robinson had Chester Weston survey the lot during the spring of 1895. 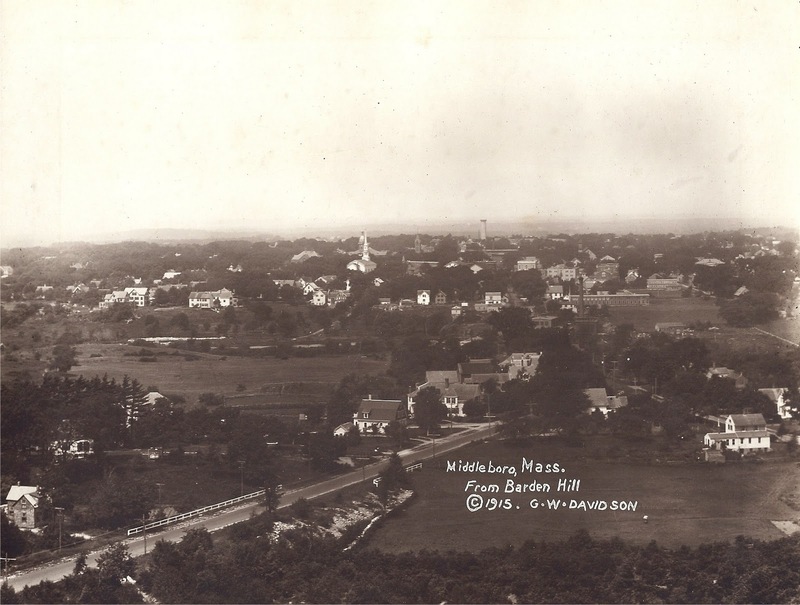 Eventually, the Barden Hill site was acquired from Robinson on January 18, 1896, and a 12-inch water main extension constructed from Fairview Street up Wareham Street to the top of the District’s lot. “We have a lot, all paid for, and we have a 12-inch pipe carried up the hill and into the lot, all paid for, which is of but little service, except with [a] … reservoir” to supplement Forest Street. Despite these preparations, it would be nearly another twenty years, however, before the Barden Hill standpipe was constructed. I believe that the Barden Hill Standpipe was the tallest concrete structure/or of its kind in the U.S. at one point. Is this true do you know? This is true. At the time that it was constructed, the Barden Hill standpipe or water tower was the tallest reinforced concrete water tower in the U. S. I have posted more information on the tower and its engineering significance under April 10 where you can read more.